This article shows how to make a spiral cut technique for cutting rubber molds used to replicate master models in wax form. Master models used in mass jewelry manufacturing range from simple one-part pieces to intricate multiple-part forms. Rubber molds made from these master models are the key to reproducing consistent replicas of the original in wax form for casting. Cutting a rubber mold is a master craft in itself. A rubber mold is heat-formed around the metal master. When it’s cured, the mold must be cut to remove the model and ensure two critical outcomes: the successful injection of molten wax to completely fill the mold cavity and the release of the resulting wax replica without distortion or breakage. Cutting a rubber mold for a plain half-round band is a fairly simple task, but cutting one for a ring with a gallery or basket setting poses certain challenges. 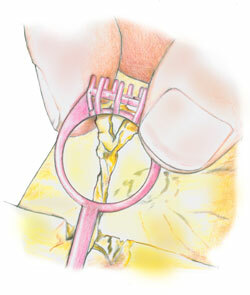 This is designed to facilitate the successful release of a cage-like wax model from a mold. After making initial cuts and creating your mold locks, cut along the sprue, the sides of the model, the finger hole and the gallery wires. Finally, cut across flat and parallel to the top plane of the setting to expose the top of the gallery wires. Release the master. Draw a spiral with a ballpoint pen on the top flat section of the rubber, inside the gallery wires. Push a scalpel blade straight down into the rubber. Carefully guide the blade along the spiral. Do not force it. The blade should remain perpendicular to the top surface while cutting, and the spiral cut should be the same depth all around (Fig. 1). 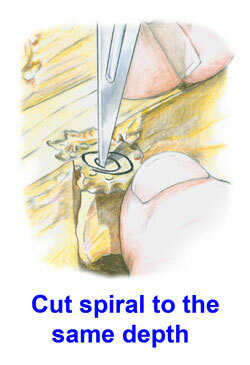 Next, you will cut the base of the spiral at the depth of the cut. 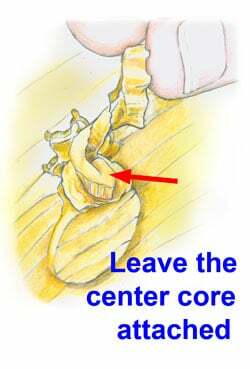 The objective is to release the outer spiral but leave the center core attached. Use caution as you guide the blade (Fig. 2). The spiral cut allows the mass of rubber within the gallery cage to uncoil and release from the center outward (Fig. 3). With the simultaneous stretching and thinning of the rubber as it’s being pulled, the mold is essentially “poured” out of the cavity through the small opening. The result is a wax model with no distortion or breakage and a rubber mold that becomes a most valuable asset in the production process. For more information on GIA's Jewelry Manufacturing Arts program, click here.